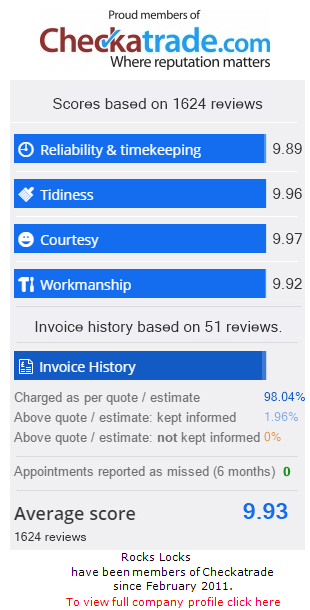 As a member of Checkatrade, I’m proud to have been awarded a certificate for receiving 1000 reviews. I joined Checkatrade as I believe it serves a valuable purpose in giving consumers the reassurance and help they need to find trustworthy and reliable tradespeople. Here’s why Checkatrade is such a respected organisation. This is a question I’m asked a lot, and my advice is to undertake a security survey of your home or ask me to come and take a look, so I can identify any areas that could be improved. For the period of October 2016 to September 2017, a breakdown in crime from Hampshire Constabulary showed 10,789 incidents of burglary. The figure from Surrey Police for the same period was 6181. Thames Valley Police recorded 13,725 burglaries. Homes with no security measures in place are five times more likely to be burgled than those with simple security measures. Good window locks and strong deadlocks can make a big difference. Marking up your valuables can act as a deterrent to thieves as clearly identifiable property is more difficult to sell and its value is reduced for the thief. Plus, you are more likely to have your property returned to you in the event of it being lost or stolen if it’s identifiably yours. Where’s the best place to put a burglar alarm? When it comes to securing your home, a burglar alarm offers increased protection and peace of mind. There are a variety of intruder alarm systems on the market with different types of detectors to choose from, and it’s the positioning of these sensors that’s key to the effectiveness of the alarm. Burglars are quick to take advantage of any unlocked doors or windows – and they can also force their way into a property with surprising speed too. Here we take a look at some of the common entry points thieves use to get into homes.